With all the establishments that have opened in Boracay, people may wonder, where’s our favorite convenience store? After all, Boracay is a destination that never sleeps, making it the perfect candidate for a 7-Eleven. Philippine Seven Corporation (PSC), country licensee of the world’s leading convenience store chain, 7-Eleven, finally opened its first two stores in Aklan, located in Caticlan Jetty Port and Tourist Center, Station 3. PSC’s grand opening celebration of its first Boracay store was held on May 29, 2015. PSC will end the year with three stores in Boracay and Aklanons can expect a total of 11 stores to open in the span of 3 years. “We’re excited to be in Boracay, it is a very promising market that is still growing. We are happy that 7-Eleven is the first international convenience store to open in one of the top tourist destinations in the country,” said Jose Victor Paterno, PSC President and CEO. PSC started its operations of 7-Eleven in the Philippines in 1982 and it now has 1,372 stores to date. It recently opened its first store in Mindanao at Abreeza Mall last May 8, 2015. Locals and tourists will now be able to enjoy the unique offerings that made the store loved by its patrons. Customers can expect to get a taste of the iconic frozen drink, Slurpee, especially in the midst of the summer heat. Other classics include Gulp drinks, Big Bite hotdog and siopao, as well as new offerings under the 7-Eleven brand such as Fundae ice cream and their newly launched honest-to-goodness coffee, City Blends. 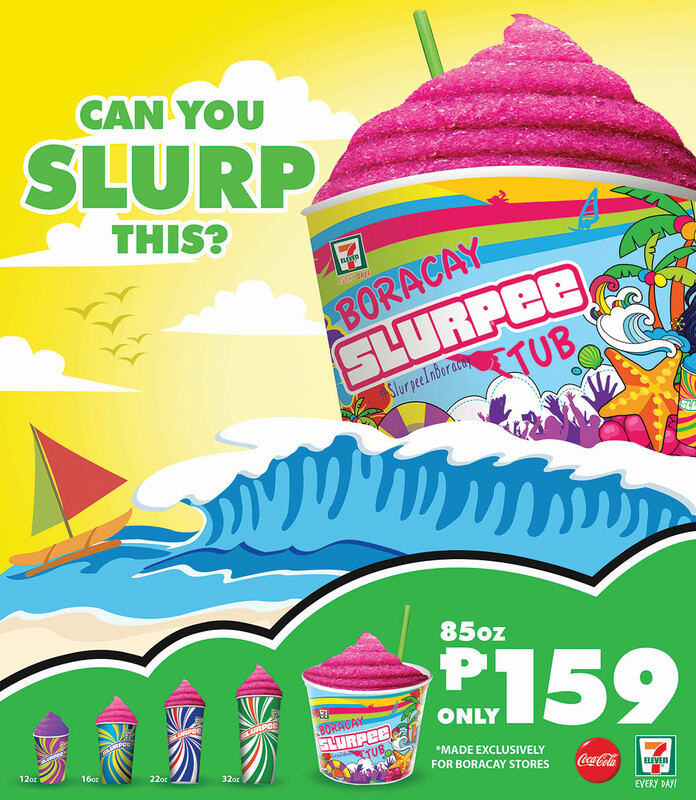 To make the grand opening more exciting, 7-Eleven is launching a special, limited edition offering exclusively for Boracay. Given that the island is one of the country’s top summer destinations, it seemed only appropriate to pay homage with the Slurpee Boracay Tub. For only Php159, customers can enjoy 85 oz of glorious Slurpee. The tubs come in two cute designs they can choose from. Bonus: The tubs are made of plastic, which means customers can collect and reuse them. Slurpee sand buckets, anyone? After the simultaneous expansion in the Boracay and Panay islands, PSC is also looking at potential cities like Bohol and other municipalities in Eastern Visayas to offer the convenience 7-Eleven has always given their customers.